Whether deserved or not (and I’ll plead the fifth on that), New Yorkers often get a reputation as complainers. Even worse, if you’re not a complainer, you may get dubbed a whiner. But Long Island’s Al Iaquinta is not a complainer or a whiner, so if you expect him to talk about the things he’s given up to be a 27-year-old UFC fighter competing in a co-main event tomorrow night against Ross Pearson, this isn’t that guy. “This is the life I’ve chosen,” he said. Of course, the way this topic came up was when discussing Iaquinta’s loss to Mitch Clarke earlier this year. Not to beat a dead horse, but it does pay to repeat that while most fighters don’t like to lose, Iaquinta hates it, and that’s what makes him who he is as a fighter. People appreciate someone with that much competitive spirit, hence, the topic of the Clarke fight once again. That win was a third round TKO of Rodrigo Damm in September that was clearly Iaquinta’s best performance as a UFC fighter. Sharp everywhere from the start to the finish, “Raging” Al basically erased the memory of the Clarke fight in 12 minutes and 26 seconds. It was as close as you’ll get to a perfect game in the fight business, and Iaquinta says that it all started from the time he woke up in Connecticut on fight day. 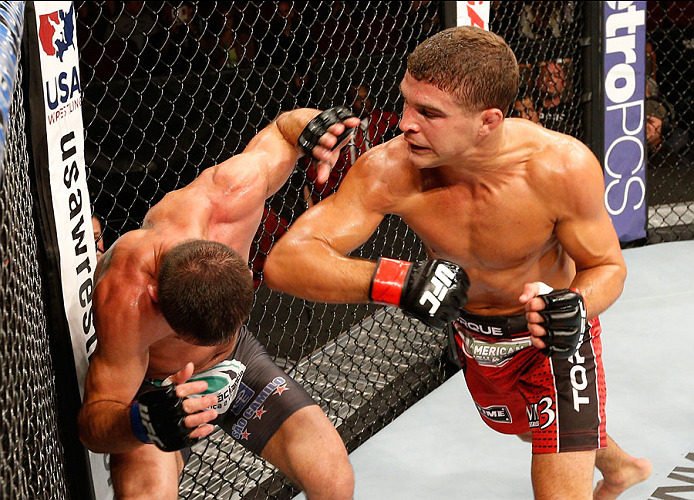 The victory was Iaquinta’s fourth since entering the UFC after season 15 of The Ultimate Fighter, and it put him back on track for what turned out to be a big fight against Pearson. But when discussing the Clarke and Damm bouts, and the turnaround from May to September in terms of attitude, I wondered aloud why other fighters say losses are “just part of the game” while Iaquinta took losing as a supreme insult. So with that mindset, it wasn’t surprising that he jumped right back into the fray and accepted a fight with Pearson just two months after the Damm fight.